The South Carolina Stingrays are proud to host the Annual Pink in the Rink presented by East Cooper Medical Center benefiting Susan G. Komen Lowcountry at the North Charleston Coliseum! This one-night only pink-themed event features exclusive Pink in the Rink Stingrays jerseys, pink ice, live game-worn jersey auction and free parking! 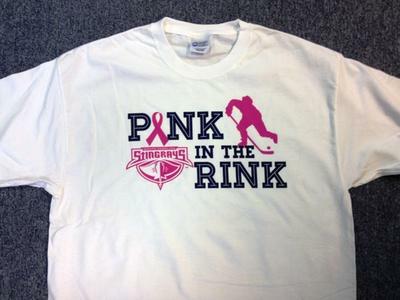 Help find a cure for breast cancer and enjoy the hard-hitting action of Stingrays hockey with a 2013 Pink Pack! Fans will receive a ticket to the game with best available seating, an exclusive Pink in the Rink shirt, puck and hat and a ticket to Hockey 101 hockey school with the Stingrays coaching staff! A portion of all the proceeds generated through Pink Pack sales, jersey auction special events will be donated to Susan G. Komen Lowcountry to help find a cure for breast cancer! For dates and to purchase your Pink Pack visit stingrayshockey.com. Join in and write your own page! It's easy to do. How? Simply click here to return to Submit Your FEBRUARY Charleston Event .